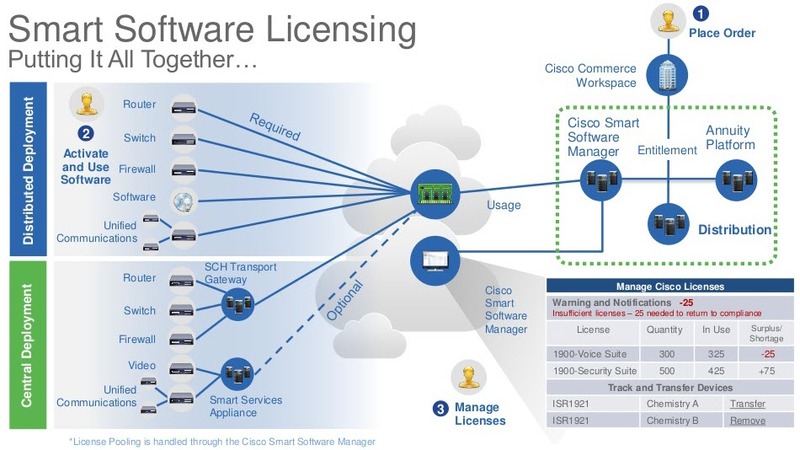 In brief, Smart Licensing is a simplified license management system in which all customers’ licenses (for products that are smart license enabled) are managed through a central Cisco smart license cloud portal. The cloud portal maintains an account of what the customer has bought and what they are using. The portal alerts the customer if they go out of compliance. This Q&A covers smart licensing only as it relates to wireless controllers. Q: Do all wireless controllers support smart licensing? If not, are there any plans to have it available on all wireless controllers? A: No. Smart licensing support is available only on the Cisco 5520 and 8540 Wireless Controllers and the Cisco Virtual Wireless Controller (vWLC) with AireOS Release 8.2 or later. It is also planned for converged access controllers in upcoming 16.x releases. There are no plans to enable smart licensing on other existing controllers (the Cisco 2504, 5508, and 8510 Wireless Controllers; the Cisco Flex 7510 Wireless Controller; and the Cisco Wireless Services Module 2 [WiSM2]). Q: Does the customer need to buy different SKUs to use smart licensing? A: No. The customer can continue to buy existing SKUs for the 5520 and 8540 and the vWLC. Q: How would the customer use smart licensing for new license purchases and for already purchased 5520, 8540, and vWLC licenses? A: Step1: If the customer does not already have a smart account, the customer (or partner for a partner-managed account) would need to create a smart account for the customer’s company. (You need only one smart account per company.) The customer (or partner) can review the details of the smart account creation process or register for live training on smart account creation at https://communities.cisco.com/docs/ DOC-56985. Step2: After the licenses have been purchased, the customer should contact the Cisco Global Licensing Operations team by email, using the template below, with appropriate information to request the migration of their vWLC, 5520, and 8540 license entitlements to the customer’s smart portal. Note that this migration may take up to 72 hours. The customer should continue using right-to-use (RTU) licensing until the license migration is complete. Request: Migrate the following wireless controller licenses to smart licensing. * Virtual accounts are subaccounts that a customer can create inside their company’s smart account to virtually separate different entities within organization. Virtual account creation is optional. More information regarding virtual accounts can be found in the General Smart Licensing Q&A at: https://www.cisco. com/web/ordering/smart-software-licensing/index.html. Step3: Enable smart licensing on smart-enabled wireless controllers (refer to the deployment guide for details). By default, the 5520, 8540, and vWLC will continue to enable RTU licensing. 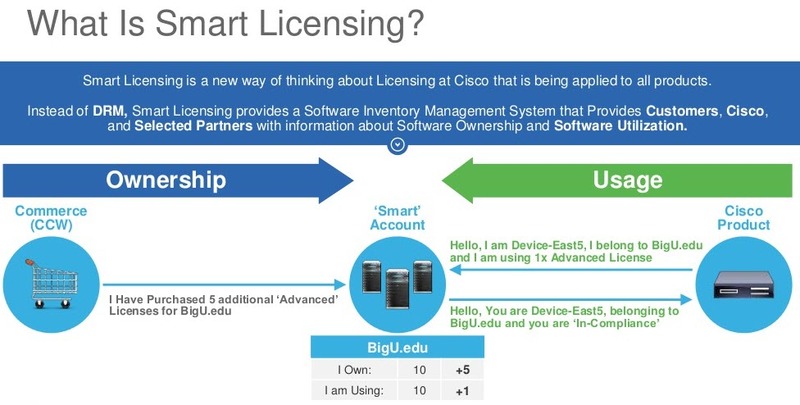 Q: Is smart licensing related to Cisco ONE Software? A: Smart licensing and Cisco ONE Software are not substitutes but complements to each other. Cisco ONE Software is a choice about how the customer procures the licenses. Smart licensing is a choice about how the customer enables the licenses. For 5520, 8540 and vWLC access point licenses, procurement choices available to the customer include Cisco ONE Software SKUs, bundle SKUs, and a la carte SKUs. Procurement choice determines whether the license is portable across wireless controllers or not. For the 5520, 8540, and vWLC access point licenses, license enablement choices available to the customer include RTU and smart licensing. Q: What is the main difference between traditional node-locked and RTU licenses and the new smart licensing? A: The traditional node-locked and RTU licenses are tied to a serial number and reside on the wireless controller, while smart licenses reside on the cloud portal. For smart licensing, the wireless controller reports only the usage (how many access points are connected to it). Since the licenses are not tied to a serial number, they can be pooled across the same product families. Q: Since smart licenses are tied to a customer and not to individual devices, does this mean the customer will be able to pool all their wireless controllers’ access point licenses and use them on any wireless controller? A: No. Although with smart licensing, the licenses are not tied to a particular serial number, the smart licensing portal allows wireless access point licenses to be pooled only within the same wireless controller product families. 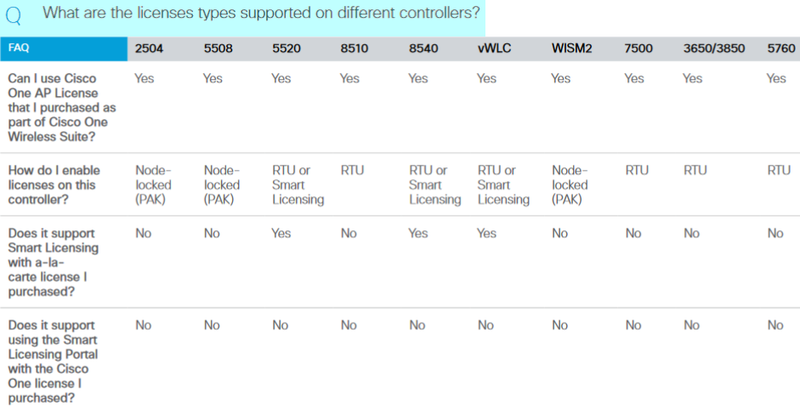 Among the controllers that are smart license enabled, Cisco considers the 5520 and 8540 to belong to the same product family, and the vWLC to be a separate product family. So access point licenses can be pooled across all 5520 and 8540 controllers. Access point licenses can also be pooled across all vWLCs. However, 5520 and 8540 access point licenses cannot be pooled together with vWLC access point licenses. Q: Why are there separate product family pools within smart licensing? A: Note that the customer does not have to pay anything extra for smart licensing, and it is primarily meant to ease license management and monitoring. It is not designed to provide extra entitlement benefits. Customers wishing to port licenses across all wireless controllers should look at procuring Cisco ONE Software licenses. Q: How does the pooling work? A: All licenses bought by a customer for a particular wireless controller product family are pooled together. A license from the pool will be used when an access point connects to a controller that has smart licensing enabled and belongs to that product family. For example, say a customer buys 300 access point licenses for the 5520 and has three 5520 controllers (5520-1, 5520-2, and 5520-3) in the network. If 53 access points are connected to 5520-1, the available license pool in the smart portal will go down to 247 (300 – 53). These 247 licenses are available for 5520-2 and 5520-3 to use. If 5 access points are disconnected from 5520-1, 5 licenses will be returned to the pool and 252 (247 + 5) licenses will be available for 5520-2 and 5520-3 to use. If 270 access points are then connected to 5520-2, the customer will go out of compliance (using 270 licenses with only 252 available) and will be notified. The network operations, however, will not stall while the customer is out of compliance. Q: Does the smart licensing portal distinguish between base and adder licenses? A: No, the smart licensing portal does not distinguish between base and adder licenses. Q: Does the smart portal support the use of Cisco ONE access point licenses that the customer gets as part of the Cisco ONE Software suite? A: Cisco ONE Software license support is not available on the smart portal in AireOS Release 8.2. Q: Do the devices (wireless controllers) have to be connected directly to the cloud if the customer wants to use smart licensing? A: No. Smart licensing allows two main modes of connecting to the smart licensing portal: (1) Data to be sent directly to the cloud by the controller (using HTTPS and HTTPS proxy) and (2) data to be sent to the cloud by the controller via an on-premises satellite collector (such as the Smart Call Home Transport Gateway that is available as a VM download at no cost). Please refer to the deployment guide for more details. Q: Is smart licensing the only licensing option for smart enabled wireless controllers or can the customer continue to use RTU licensing? A: Smart licensing is optional. If the customer does not wish to use smart licensing on controllers enabled for smart licensing, the customer can continue to use RTU licensing on the 5520, 8540, and vWLC. For additional questions regarding RTU licensing, refer to https://www.cisco.com/c/en/us/products/ collateral/wireless/flex-7500-series-wireless-controllers/ qa_c67-713536.html. Q: What will happen if the customer tries to connect more access points to the controllers of a particular product family than the number of licenses the customer has for that controller family? A: The pooled license count will go negative for that controller model family. The customer will get a notification that they are out of compliance. The network operation will not be disrupted while the customer makes arrangements to get back into compliance. Q: Who will be notified if the customer goes out of compliance? A: The smart account creator (the customer or the partner, in the case of partner-managed accounts) can set who gets notified when the customer goes out of compliance.